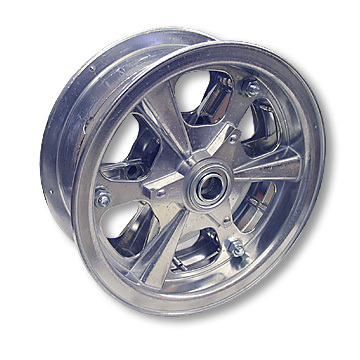 8" custom aluminum alloy split rim wheel. With 3/4" ID ball bearing. Works with our AZ2217-ID , AZ2217-OD , AZ2218-ID or AZ2218-OD sprocket/drum assemblies by drilling out 1 hole. Use with 480/400x8, 14-300x8, or 410/350x8 tires.